Protecting new crop cotton prices – Thrakika Ekkokistiria S.A. Potential price weakening effects continue to loom. My recent articles and outlook presentations have warned of potential price weakening effects of a large 2019 crop and increasing 2019/20 carryout stocks. 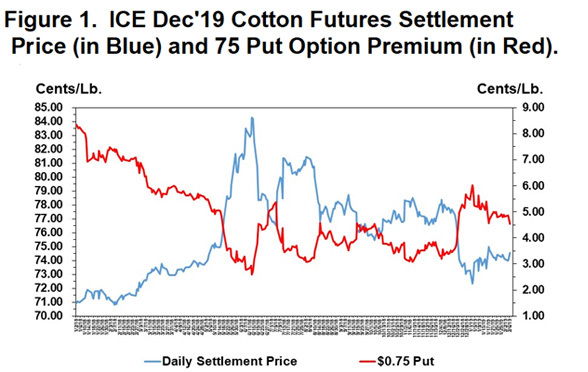 If such an outcome happens, we could conceivably be looking at a 10 cent to 15 cent decline in Dec’19 cotton futures on the ICE. Cash cotton prices would similarly decline under that scenario. And, with little forward contracting going on, the 2019/20 marketing year average price would likely be the average of prices on the lower end of such a slump. Such a drop in prices would not be helped by the marketing assistance loan program. And, in the absence of yield loss, most revenue insurance policies would not start paying until Dec’19 cotton futures prices were 60 cents or lower. For seed cotton enrolled in the PLC program, there should be some buffering effect of declining lint prices by an increasing PLC payment rate. It is challenging to give numerical examples of how much price protection is provided by the seed cotton PLC program. It depends on cottonseed prices, payment yields, seed cotton base acreages, and farm size. New cotton growing areas may not have any seed cotton base. And commercial sized cotton farms with seed cotton base might have payment limits kick in and cap their PLC payment if cotton lint prices have a 10-plus cent decline. This still leaves growers facing some downside price risk exposure. My inquiries to cotton merchants indicate little current forward contracting activity is happening. The current disruptions to U.S. cotton trade flows and the likelihood of large new crop supplies suggest that forward contracting opportunities may continue to be limited for a while. That leaves hedging with futures and options as a possibility. As I write this (Feb. 6), Dec’19 futures settled at 74.56 cents per pound. Figure 1 (blue line) shows how this contract has been stair-stepping down to lower ranges since mid-2018. Figure 1 also shows how the right to have sold Dec’19 at 75 cents, also known as a put option, has fluctuated in value (the red line) with the changes in the underlying futures contract. The put option at a given strike price gains in value as the futures price declines. Hence it represents an insurance policy against a decline in the Dec’19 below an effective coverage level of 70.5 cents; i.e., the 75 cent strike price less the 4.54 cent premium for the put option, circa Feb. 6. Hedging at these price levels is a bit of a dilemma. On the one hand, buying a 75 put implies a minimum cash price in the mid-60s, likely below total costs of production. The opportunity to hedge above costs of production faded when Dec’19 futures fell below 80 cents. On the other hand, spending 4.5 cents on a put option to buffer a potential drop of 15 cents makes some sense in insurance terms. One thing is for sure: All of these approaches would look better if the market were to rally back toward 80 cents. The put options get cheaper and the coverage levels get higher.